Meet Harry The Duck. 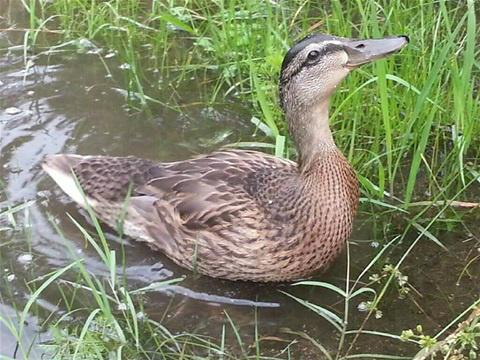 He was found drowning in the duck pond at Island Deli & Café off Highway 17 in Pawley’s Island, South Carolina. By drowning, I mean a turtle was pulling him under. At the time, Harry was just a little peep, about a week old, and apparently a snacking idea for the turtle. “My husband, Rob, got a pole and stirred the mud making the turtle let go of him,” Penny Thomas Barbour said of his rescue. “The poor little guy,” I offered. Since then, several of Penny’s Facebook friends have been following his story. She posts pictures of him frequently and informs everyone of his progress as he grows into a fledgling. It’s been apparent to us for some time now that Harry knows his mama. A thought occurred to me while I was talking to Penny: Harry is a duck, he needs water, a pond is best. And, what about food? What does one feed a duck for a nutrionally balanced diet? Penny has been warned though, that as Harry learns to spread his wings and fly, he’ll be flying alongside of her truck every time she leaves the house.